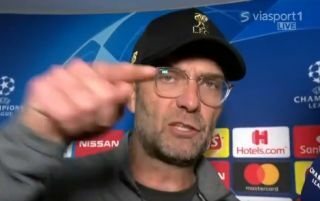 Liverpool manager Jurgen Klopp really lost it in his interview with Viasport after today’s 2-1 defeat to Paris Saint-Germain in the Champions League. Asked about the diving of PSG forward Neymar throughout the game at the Parc des Princes, Klopp did not want to be drawn into accusing the player of play-acting or cheating. However, the German tactician made himself pretty clear with this rant as he invited the reporter interviewing him to give his opinion on Neymar. He declined, but Klopp was insistent and snapped at him for not having the ‘balls’ to say what he thought. Not a good night for the Liverpool manager, who now needs the right result against Napoli in the club’s final group game.